allen_andrew, brown_jane, brown_john, burgis_mary, chamberlain_mary, committee, compton_deborah, eyewear, food, gosling_ann, hill_ann, hoar_thomas, hornby_cecelia, leave, lediard[? ]_mrs., lindsey_edmund, mason_john, miburn_?, miburn_infant, outdoor relief, pauper family, pension, policy decision, ricketts_mrs., shepard_mary, stormer_catherine, stormer_john, vicent_thomas, ward_mary, watson_frances, winn_? 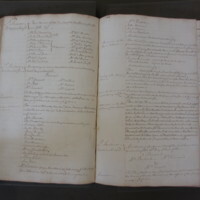 St Andrew Undershaft Workhouse Committee, “St Andrew Undershaft - Workhouse Minute Book 1748-1780 p164-165,” Virtual Workhouse Digital Archive, accessed April 24, 2019, https://virtualworkhouse.carleton.edu/items/show/1515.